What's It Like to Work with Paige? CAN HELP YOU HEAL YOUR LIFE. Do you feel like you came to Earth at this time for a purpose? Do you wonder where you fit into the expanse of the Universe? and what do they mean for me? How can I heal once and for all? How do I make the journey to cross over into the next dimension? The Soul Map will answer all these questions and so many more! CLICK HERE to read special EXCERPTS from THE SOUL MAP! You Were Created By Love. Then the Creator gave you co-creative abilities to make All That You See. This world truly is a reflection of your innermost state. The Soul Map makes this concept easy to understand by describing the process of your Soul's journey, step by step. Each Soul travels the same path toward enlightenment. The Soul Map outlines the steps of that path in detail. From First Density on through to Seventh Density, your soul's task is to "remember" who it was in the beginning, and to "return" to that same state in the end. Reading The Soul Map will help engage your hidden soul memories, igniting your innate cosmic knowledge, nudging them to bubble up to the surface. The Soul Map will help you remember who you are and why you are here. only the ones who were truly READY would find it. Where is this secret hiding place? Within the Human Being himself. Chakra 1 - Holds all the holographic information your soul needs to exist in a created, physical state. Chakra 2 - Holds all the holographic information your soul needs to connect with others. Chakra 3 - Holds all the holographic information your soul needs to know yourself autonomously. Chakra 4 - Holds all the holographic information your soul needs to forgive and love unconditionally. Chakra 5 - Holds all the holographic information your soul needs to recognize and embody Wisdom and Truth. Chakra 6 - Holds all the holographic information your soul needs to become one with all of creation. Chakra 7 - Holds all the holographic information your soul needs to merge back into your true state with the Creator. If we look with a deep, mystical eye, what we see that your chakras hold sets of CURRICULA for your soul to learn. The chakras are your soul's map to enlightenment. We find that we're not just talking about spinning wheels in the body, this is far more intricate and incredible that that! What we've got here are whole WORLDS which our soul navigates through on it's way back home - the actual PATH the soul walks, making its way toward enlightenment. Earth is going through a big change at the moment. We are currently shifting from Third Density to Fourth Density. In other words, we are graduating from our third chakra curriculum to our fourth chakra curriculum. 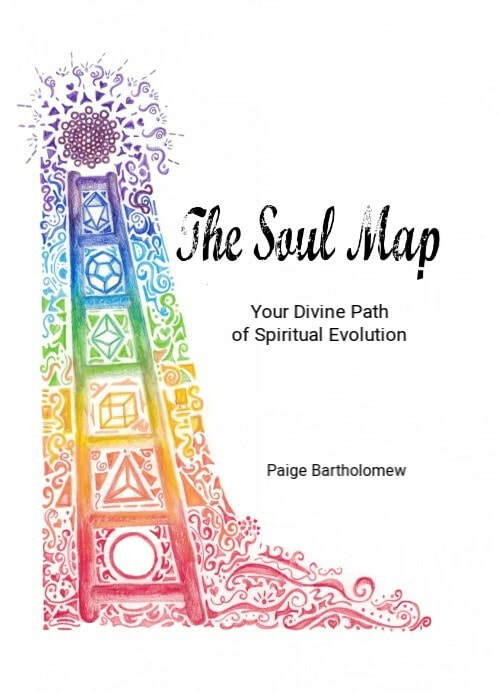 The Soul Map goes into great detail about this shift. You'll read chapters describing each density, and even a whole chapter on specific exercises to help you make your shift into 4D. You may be asking yourself, "How did she come to know this information?" To be quite transparent, the information was always within me (as it is within you). I am not a channel, nor am I psychic. Through several catalyzing events in my life, my latent memories came to life within my conscious mind. The best way to describe how I know this information is to say that I remember it. You can remember it too. This information lies dormant in us all, asleep within our chakras. The Soul Map will help you wake up to remember the Truth of who you are! When you donate to help publish THE SOUL MAP, you'll receive a FREE hour-long "LOVING YOURSELF" meditation, never before published. When you pre-order you book on Amazon, you will be helping us qualify for standing on the New York Times book list! Books will be published and ready to ship by early 2018. I thank you with all my heart for your support through this journey of writing. I could not have written the book without the yearning of my sisters and brothers for this information to come through. So, it's really true when I say, this book is FOR you, BY you, FROM you and TO you. This is our collective destiny. Let's walk the path together. © 2016-2017 Paige Bartholomew. All rights Reserved.